A new ‘lend a dog’ scheme at a Richmond retirement village in Nantwich has proved to be a roaring success, with the local community lapping up the chance for residents to pamper their pooches as part of a weekly arrangement. Nicola Jackson, senior village adviser at Richmond Nantwich sent out a message to Facebook to ask any local dog owners to ‘lend’ a dog to the retirement village, with the post receiving over 3,000 views as well as numerous shares and ‘likes’ on the social media platform. A number of people offered to loan their dogs to the home to spend time with the residents and it’s been such a success that it’s now become a weekly arrangement. Nicola Jackson, senior village adviser at Richmond Nantwich said: “We had an amazing response which resulted in a number of owners getting in touch. 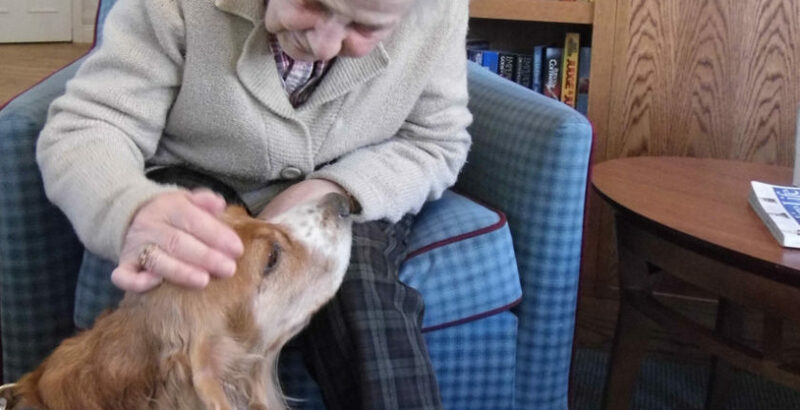 To date, four local residents have brought their pooches in to spend time with the residents. Richmond Villages has been designing, building and operating its own villages for almost 20 years. The company already operates seven luxury retirement villages located in Cheshire, Gloucestershire, Oxfordshire, Northamptonshire and Warwickshire. Its new village at Aston-on-Trent, Derbyshire opened recently, and its eighth village at Wood Norton in Worcestershire is now under construction.